"We set a record! We had 28 people for postcarding in Gearhart on Friday! We did 310 postcards at the party (that’s the most ever!) and our Mid-Week Postcarding Elves (Kathi, Meridee and Jeanne) did 190 postcards to bring our weekly total to 500 postcards to voters in OR-2!!!!! Lovell Taproom at Fort George Brewery, 426 14th Street, Astoria. Join Nicholas Bowling and the Really Do Care INCO Under 40's to enjoy good company while writing postcards to voters. "I have 80 postcards to write and would love some help! I have the cards, pens, and postage," says Nicholas. Astoria, Gearhart, Seaside, and Manzanita! Countdown: Only 43 days until the midterm election on November 6! • Postcards to Voters: To reach voters in key districtus, attend a postcard party; check Happenings in this newsletter for details. Rather write on your own? Sign up with Postcards to Voters or Need to Vote (postage paid). Questions? Contact Bebeat littlebylittle4change@gmail.com. 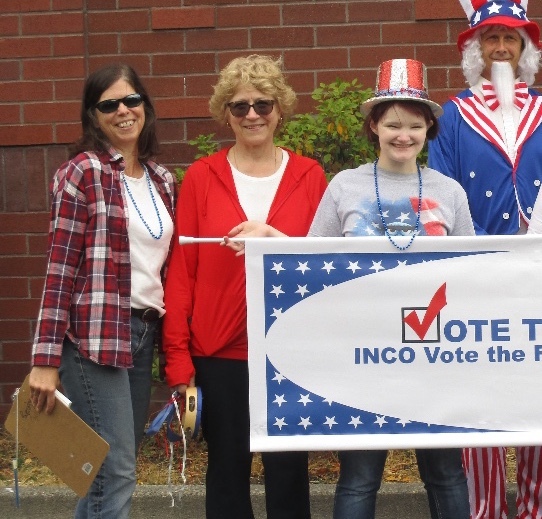 INCO canvassers are going out Saturdays and Sundays in Clatsop and Pacific Counties. Let us know if you can help here. No experience needed. Across the nation, door-to-door contacts have been putting even long-shot progressive candidates over the top. Share our INCO Voter Guide! We have 2500 copies to distribute, and you can help. Contact incoregon@gmail.com for details. PHONE: Sign up here or here to phone bank from home for candidates in key districts. 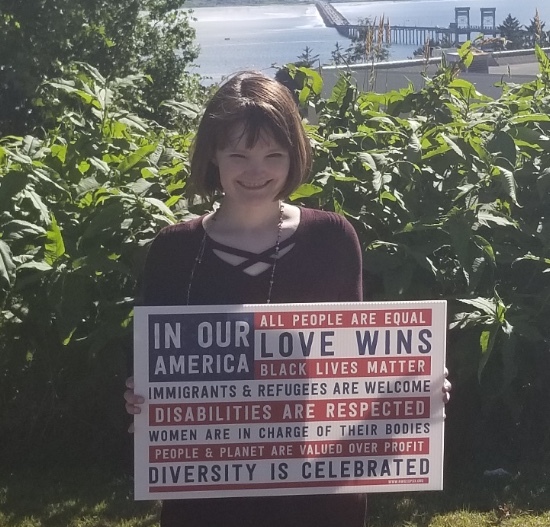 REGISTER VOTERS: Sign up here for 2 hours of hosting voters, every Saturday through the end of September at the Saturday Market at the Port of Ilwaco. Eager INCO canvassers, including a new baby Indivisible, get ready to go door-to-door to meet voters in Seaside on September 16. 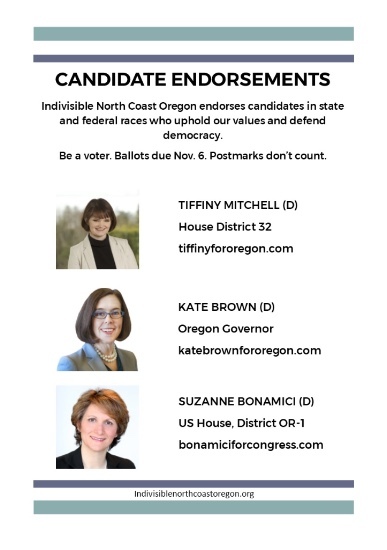 They encouraged people to vote for Tiffiny Mitchell, candidate for the Oregon legislature for House District 32. They also gave out INCO's Voter Guide for the November 6 midterm election. 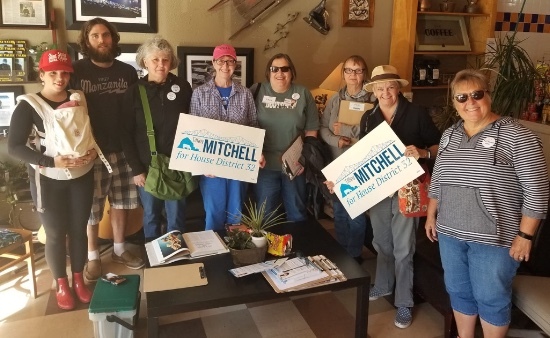 Friday, October 5 - Tiffiny Mitchell House Party, candidate for the Oregon Legislature (House District 32); 5:30 - 7 pm, 90278 Par Road, Warrenton. Hosted by Deb Vanasse and Laurie Caplan. 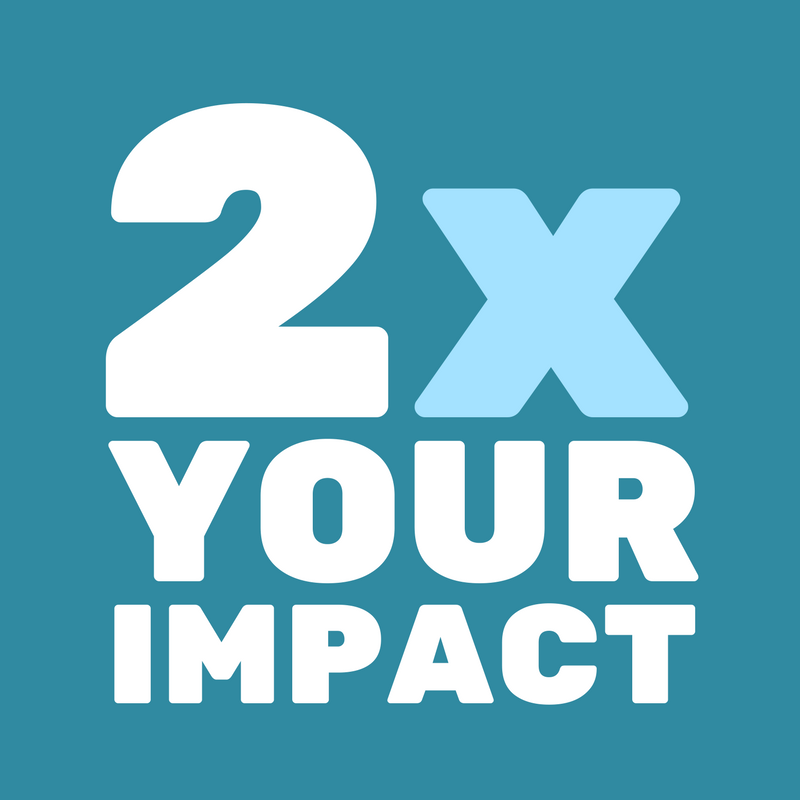 Sign up to Storm the Midterms with INCO to help flip two nearby seats and elect Democrat Jamie MacLeod-Skinner in OR-2 (Oregon's 2nd Congressional District) and elect Democrat Carolyn Long in WA-3. Our canvassers are going door-to-door with these. We don't endorse at the city or county level. Contact incoregon@gmail.com to get copies to distribute throughout Clatsop County. 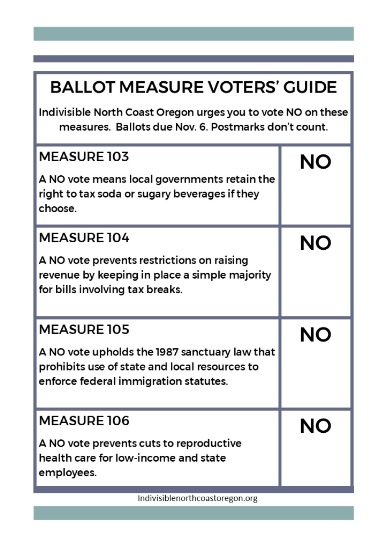 "Measure 105 is an attempt to repeal Oregon’s state sanctuary law, which prevents local law enforcement and other state agencies from using public resources to aid federal immigration enforcement. protection against assault, domestic violence, robbery, and other protections everyone else enjoys. Beyond reducing public safety, 105 would also divert already stretched funds from our local agencies to enforce federal policy. 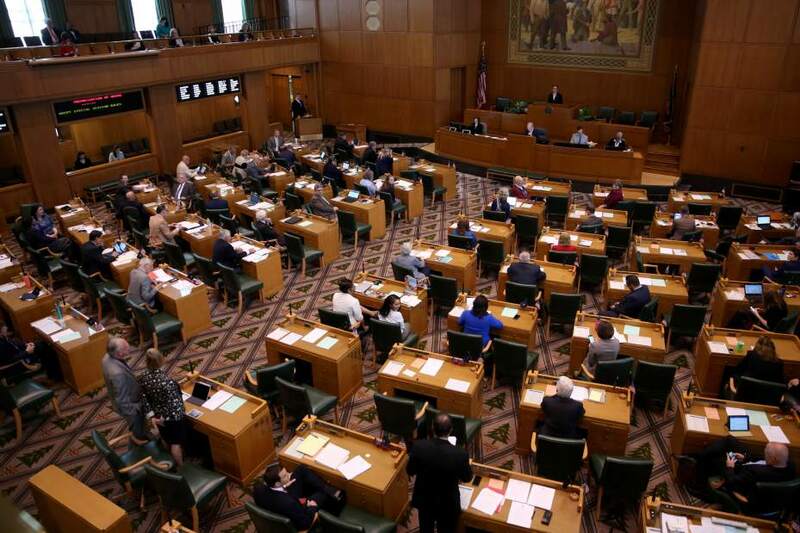 Both socially and economically, the costs are more than Oregon can afford." -- Rural Organizing Project www.rop.org; talking points for Measure 105 are here. Legislators are in Salem for 3 "Legislative Days". More than 70 people from around the state have already RSVP'd to Renew that they will be coming to Salem to support CEJ. Let's make a show of force from the North Coast - and enjoy a free tamale lunch! Eric Halperin is CEJ regional coordinator and needs passengers to take with him from Clatsop County to help amortize his fossil fuel emission/carbon footprint for driving down to Salem! For more info, including the day's schedule, contact Eric Halperin at ehod1@yahoo.com or 503-812-2200. You’re invited to a house party for Tiffiny Mitchell. She’s INCO's choice to represent Clatsop County and the rest of House District 32 in the Oregon legislature. Join us for fun, food, drinks, and lively Q & A with Tiffiny. She wants to share her vision for Oregon and hear about the issues that matter to you. West off Highway 101 on Sunset Beach Road, left onto Par Road at Country Club Estates, then bear left almost to the end. Look for Tiffiny signs! Learn more about Tiffiny at tiffinyfororegon.com/. This is a people-powered campaign, so please bring your checkbook if you’d like to help with Tiffiny’s campaign. Hosted by Deb Vanasse and Laurie Caplan, INCO co-chairs. 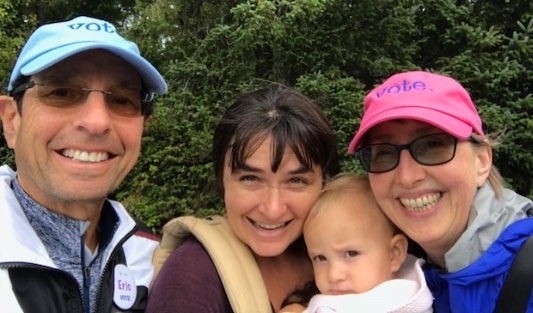 INCO canvassers were in the field Saturday in Pacific County with our youngest canvasser, Magnolia. We think her first words are going to be “Vote Democrat—or else!” We are nominating Tallie for the Most Intrepid Award for coming out to canvass with a 1 year old!!! Canvassers debriefed afterward at the Lost Roo. Tuesday, September 25 - INCO Voter Registration Drives. Register or update registrations with new name, address, or handwriting. Today is National Voter Registration Day. • 10 am - 2 pm, Clatsop Community College, Towler Hall, 3rd floor. Celebrate Beeb's 35th birthday as she and her husband work to get 35 new voters registered as they serve free birthday cake to everyone. Tuesday, September 25 - Clean Energy Jobs Action Day in Salem, 9 am - 2 pm. Meet with legislators, enjoy free tamale lunch. Schedule and carpool information available from Eric at ehod1@yahoo.com and 503-812-2200. 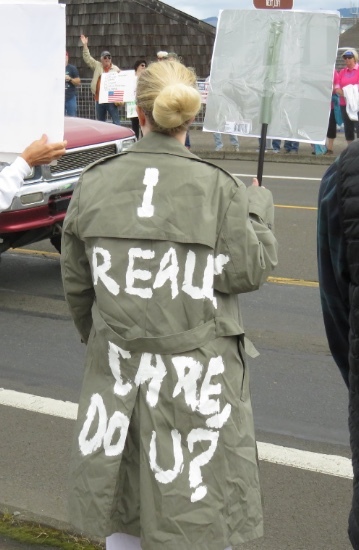 Wednesday, September 26 - Really Do Care INCO Under 40's Postcard Party, 7 pm, Lovell Taproom at Fort George Brewery, 426 14th Street, Astoria. "I have 80 postcards to write and would love some help! I have the cards, pens, and postage," says Nicholas. Friday, September 28 - Postcards to Voters Writing Party - Gearhart, 4 - 5:30 pm. Contact Bebe at littlebylittle4change@gmail.com for address. Most Fridays, same time, same place. We appreciate donations ($1-5) to help defray costs for postage. If you'd like, join us afterwards for food and drinks at the Sand Trap. Friday, September 28 - Postcards to Voters Writing Party - Manzanita, 4-5:30. Contact Cheryl at coastalmomma@yahoo.com for directions. Saturday, September 29 - Canvassing in WA-03, meet at Ocean Park Library, 10 am. Help flip our closest swing district. Carpooling options available. Email debvanasse@gmail.comfor details. Now through Election Day, November 6 - Help us #StormTheMidterms. Sign up for canvassing here; phone and text banking here. Wednesday, October 3 - AAUW Candidates Forum, 7 pm, Astoria High School auditorium, 1001 West Marine Drive. Candidates for Astoria City Council and mayor, county commission, Oregon House District 32, and governor are invited. Friday, October 5 - Postcards to Voters Writing Party - Warrenton, 4:00 - 5:30 pm, 90728 Par Road. Off Sunset Beach Road into Country Club Estates, stay left until nearly the end. Call/text 907-388-9303 for directions. No postcard party in Gearhart today. Friday, October 5 - Postcards to Voters Writing Party - Manzanita, 4-5:30. Contact Cheryl at coastalmomma@yahoo.com for directions. Friday, October 5 - House Party for Tiffiny Mitchell, 5:30 - 7 pm, 90278 Par Road, Warrenton. Tiffiny is candidate for Oregon Legislature, House District 32, and is endorsed by INCO. Co-hosted by Deb Vanasse and Laurie Caplan, INCO co-chairs. Saturday, October 6 - Astoria INCO Community Group meeting, 8 a.m., Street Fourteen Cafe, 1410 Commercial; no purchase necessary. On the agenda: another group LTE. What do you want to write about? Monday, October 8 - Deadline, "I Will Vote" Essay Contest, midnight; details here. Tuesday, October 9 - Seaside-Gearhart INCO Community Group meeting, 6:30 pm. Email incoregon@gmail.com for location. 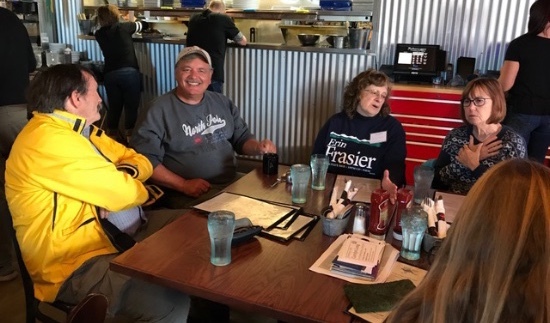 Saturday, October 13 - Warrenton INCO Community Group Meeting, 11 am, Dooger’s Seafood and Grill, Highway 101, Warrenton. No purchase necessary. We'll write postcards after the meeting to support Carmen's friend who's running for office in Iowa. 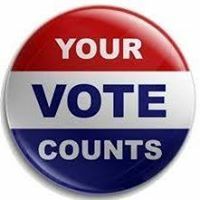 Tuesday, October 16 - the deadline to register to vote or update your registration with new name, address, or signature for the November 6th election. 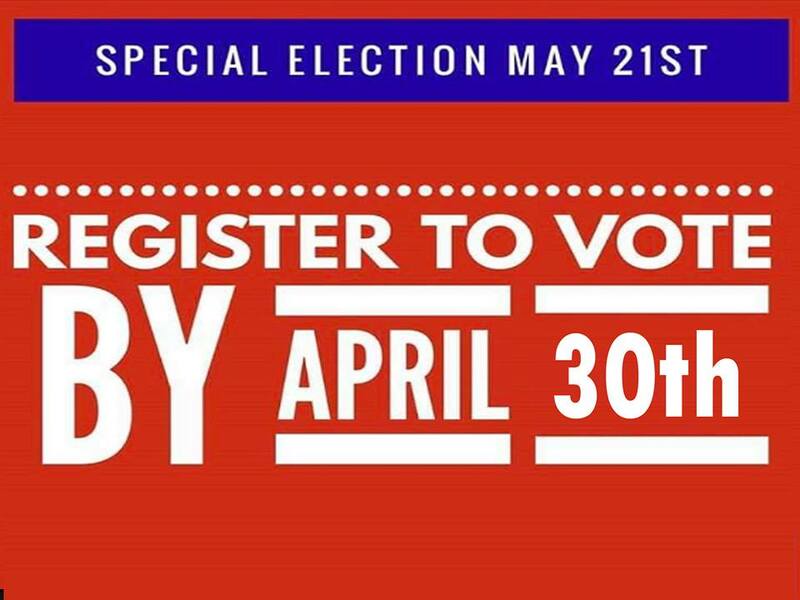 Register or update online or at the Clatsop County Elections Office, 820 Exchange, 2nd floor, Astoria. Wednesday, October 17 - INCO Vote the Future Team, 6:30 pm, Seaside Library Board Room. All Indivisibles interested in voting and elections are welcome. Wednesday, October 17 - INCO Book Club, 6:30 pm, in Astoria. We’ll discuss Jon Meacham's Soul of America: The Battle for Our Better Angels, Penguin Random House, 2018. This Pulitzer Prize-winning author helps us to understand the present moment in American politics and life by looking back at critical times in our history when hope overcame division and fear. Contact cebeady@outlook.com for directions. ASTORIA: Postcard party at Michelle's, October 18, 24, 26, and 29. 10:30 am - 12:30 pm. 1290 Irving; park down the street, walk up the driveway east of the blue house. Brunch snacks and drinks will be provided. Babies and young children welcome with a caregiver. GEARHART: Postcard party at Bebe and Eric's, October 12, 19 and 26. 4 - 5:30 pm. Contact Bebe at littlebylittle4change@gmail.com for address. Most Fridays, same time, same place. We appreciate donations ($1-5) to help defray costs for postage. If you'd like, join us afterwards for food and drinks at the Sand Trap. MANZANITA: Postcard party at Cheryl's, October 12 and 19. Contact Cheryl at coastalmomma@yahoo.com for directions. SEASIDE: Postcard party at Beeb's, Friday, October 19 and Sunday October 21, 4-5:30 pm. 985 North Wahanna, house with cedar shingles. Park on the shoulder of the road or on 9th and 10th Avenues. Beeb and Bebe are teaming up to provide more room for this week's postcard party. Hosted by INCO Under 40s and open to everyone. Cash prizes totaling $500! Open to high school students in Clatsop and Pacific counties. Deadline Oct. 8. Details here - help us spread the word! • Stop the confirmation of Brett Kavanaugh as the new Supreme Court Justice. Here's the latest guide from Indivisible. Delay the hearings and confirmation until after the winners of the November election take office. Mr. Kavanaugh is a well-known Washington insider, anti-environmentalist, and right-wing extremist, even in his judicial decisions. • Develop and enforce a humane, practical bipartisan immigration policy. • Protect all Americans. • Stand with people who need help getting medical care and enough food to eat. • Stop the administration's attacks on America's allies and embrace of America's totalitarian enemies. 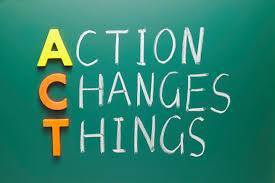 • Demand effective government actions to deal with climate change. • Provide meaningful help for Puerto Rico's recovery from Hurricane Maria. • Oppose nominees to be federal judges who fail to support equal rights for all people. INCO has Community Groups in Manzanita-Cannon Beach, Seaside-Gearhart, Warrenton, Astoria-East County, and the Washington Peninsula. All INCO Indivisibles are invited to get active with INCO's Events Team, Oppose Bigotry Team, Vote the Future Team, and Book Club. Contact Laurie at incoregon@gmail.com for more information.